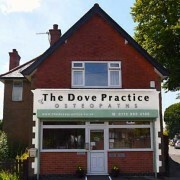 The success of The Dove Practice in providing the highest standard of osteopathic care for all our patients deserved an updated, modern and more informative website. It has been our aim to create a user-friendly, accessible site showing real photographs of our Osteopaths at work, and providing you with an overview of our Nottingham-based practice. Over the next few months we’ll update our blog to include examples of real-life osteopathic cases, to help you understand what osteopathy can do for you. In the mean time, we hope that you can find all the details you require, and we look forward to hearing from you.